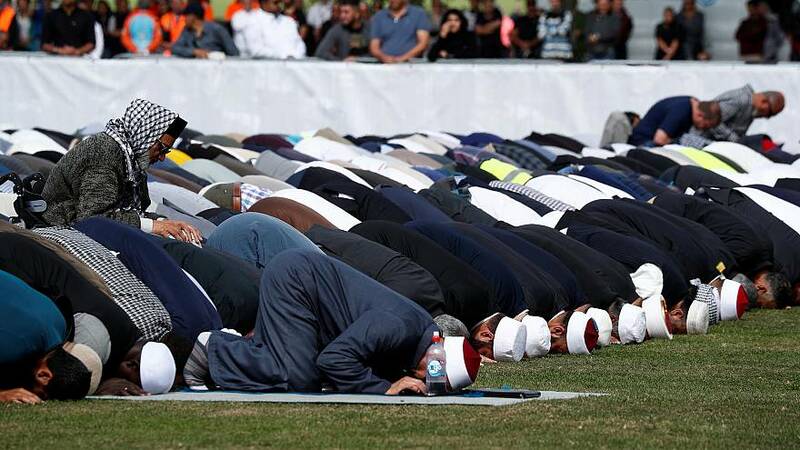 The Islamic call to prayer, the adhan, rang out across New Zealand on Friday afternoon as thousands gathered to honor the 50 people gunned down at two mosques in Christchurch one week ago.Prime Minister Jacinda Ardern led the estimated 5,000 people at the massive prayer service at Hagley Park in front of the Al Noor mosque, where most of the victims died. 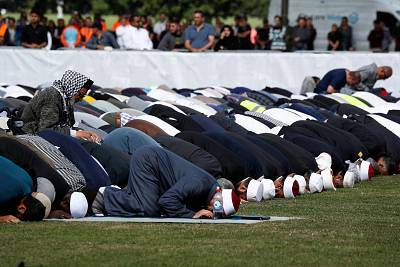 New Zealanders across the small, broken-hearted nation paused when the adhan played and observed two minutes of silence. "New Zealand mourns with you. We are one," Ardern said in a short speech. Beyond Christchurch, thousands gathered at mosques in Wellington, Auckland and other cities for the prayers, with many non-Muslims wearing headscarves.Armed police have been guarding mosques around New Zealand since the attacks, and police said a "heightened presence" was in place Friday to reassure those attending weekly prayers.Officers dotted around Christchurch wore green ribbons pinned to their chests as a sign of peace and solidarity.Candlelight vigils continued until late Thursday across the country, while volunteers prepared the bodies of the deceased for a mass burial that was expected after the prayers. Australian Brenton Tarrant, 28, a suspected white supremacist, has been charged with one murder count following the attack and was remanded without a plea.Ardern announced plans to ban nearly all military-style semi-automatic and assault rifles on Thursday.While Ardern characterized the policy as an immediate ban, she then clarified that it would be submitted to Parliament as legislation the first week of April.In the meantime, Ardern said, the government will sharply restrict access to "virtually all" such weapons by reclassifying them to require a police permit — which will be denied. "To owners who have legitimate uses for their guns, I want to reiterate that the actions being announced today are not because of you and are not directed at you," Ardern said. "Our actions, on behalf of all New Zealanders, are directed at making sure this never happens again."